With a four day holiday for holi, it was a perfect time to make a small trip to someplace. The conditions: It should not be very far and it should be interesting from the photography point of view. A little bit of Google and we came up with quite a few options. 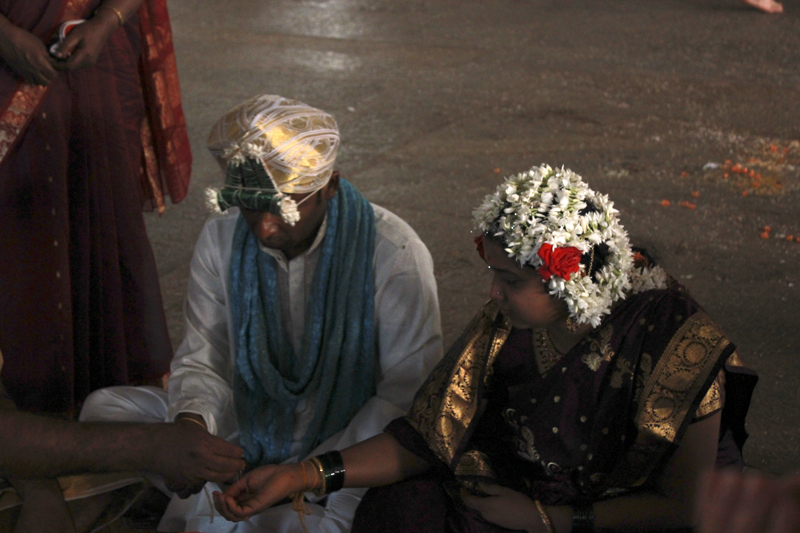 But in the end, it was Hampi I and my wife decided. 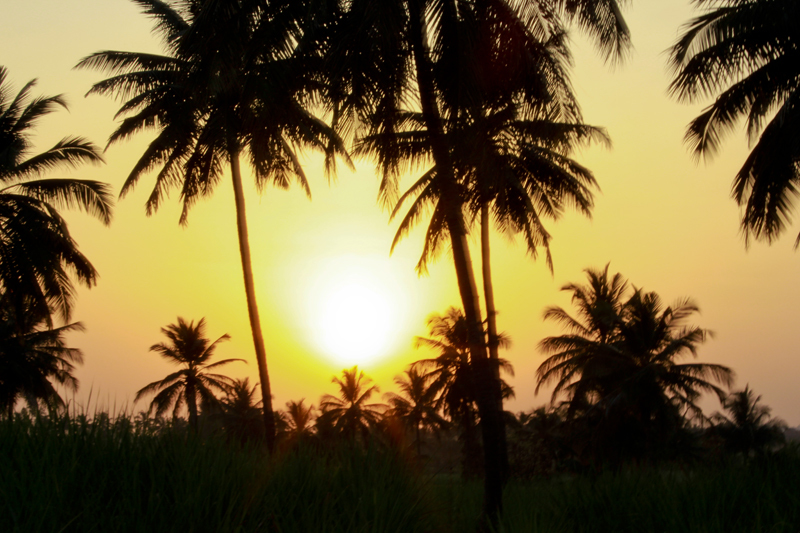 Around 710 km from Mumbai, it is a perfect place to visit when you have 3 to 4 days to spend. 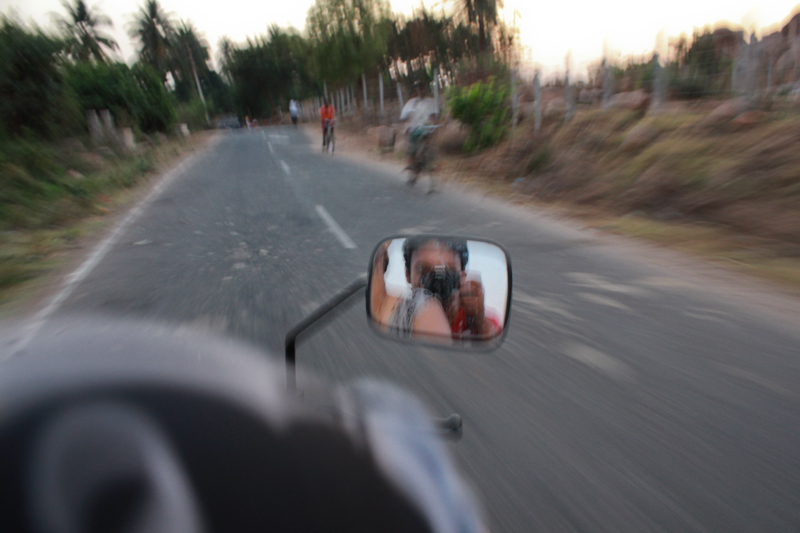 But this time, unlike other trips we decided to go by bus instead of the bike. We booked our ticket through Redbus.in for VRL buses which run almost every day from Mumbai to Hospet. We had 4 days starting from Thursday to Sunday, and the bus timing was very nice. We started on Wednesday at 7:30 PM after office from the Vashi Old toll naka stop. This was nice because on Thursday morning we will be actually at Hospet . The VRL semi sleeper coaches are really nice and comfortable, and the made sure we had a nice and comfortable sleep at night. By 8:30 AM we were at Hospet which was like almost on time. 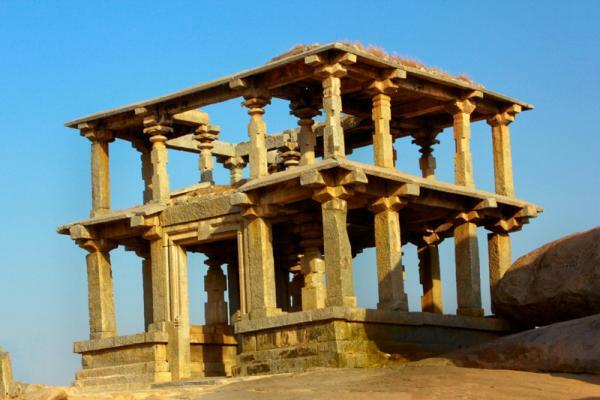 Hampi is another 13 km from Hospet. Although there are ample of buses going to Hampi from Hospet, for me auto was a better option because they promised me to show a few hotels also. They might charge a lot at the start, but you need to bargain to get a good deal. For me, it was straight from Rs 200 to Rs 130. And if you want to go by local bus, then the bus stop of Hospet is only 5 to 10 mins walking distance from the VRL bus stops and they will charge you only Rs 15. 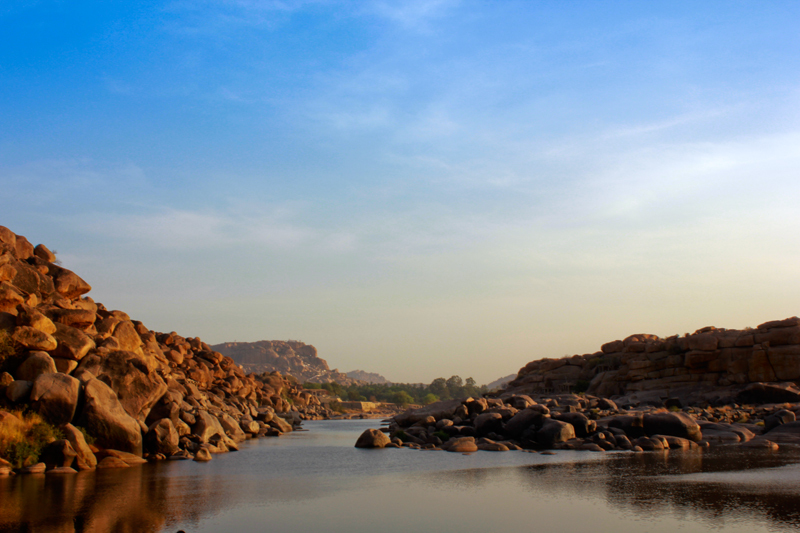 The road to Hampi from Hospet is very exciting. I could feel as if I was travelling back in time. Once we were out of the main city of Hospet, the landscape completely changed to rocky mountains, temples built in the middle of rocky lands and small villages in between (actually 2 of them). We got a nice hotel near the market of Hampi called Padma guest house. The palace is clean and the charges were nominal and the best part is that the hotel is very close to the main Hampi bazaar and even the bus stop. Within an hour we were fresh and ready to set out and explore Hampi. 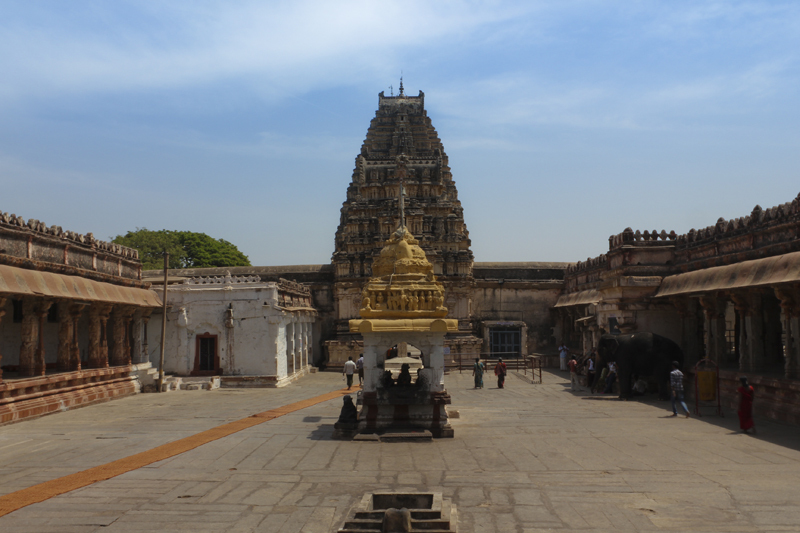 The first thing which you will automatically visit is the Virupaksha temple, also known as the Main temple. 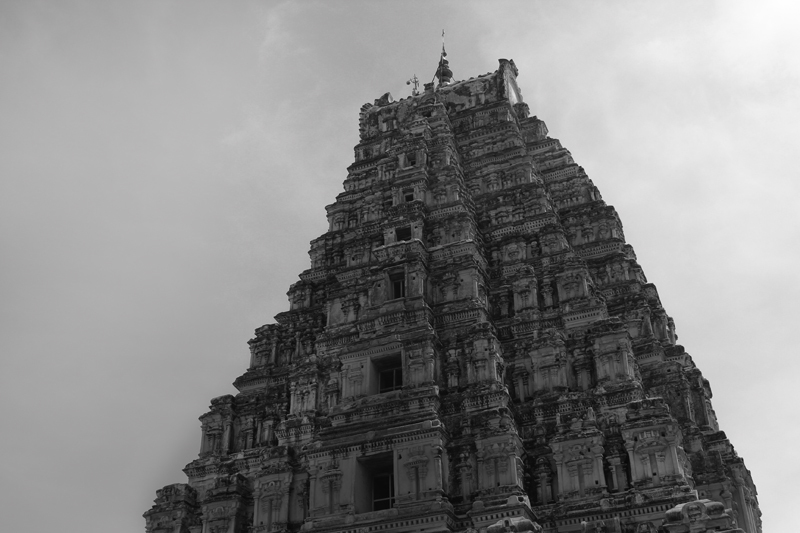 The tall main structure of the temple can be visible from almost all of Hampi. Inside the temple, they charge Rs 2 per person and if you want to take still photos then you need to pay Rs. 50 per camera. The architecture of the temple from inside is simply amazing. 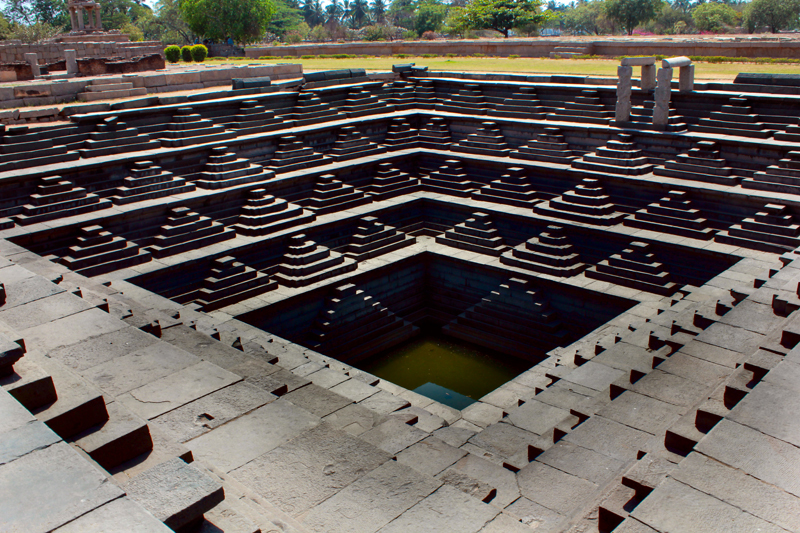 The main structure is divided into three main chambers. Well, why do I need to describe the architecture, you can get the complete details on Wikipedia ? … Virupaksha temple, Hampi at Wikipedia. Also, you should not forget to buy some bananas (really cheap) from outside the temple to feed the really playful elephant inside the temple. And if you want blessings of the elephant then you need to give him a note (at least Rs 10) and if you give coins then you will not get the blessings (a well-trained elephant I must say). 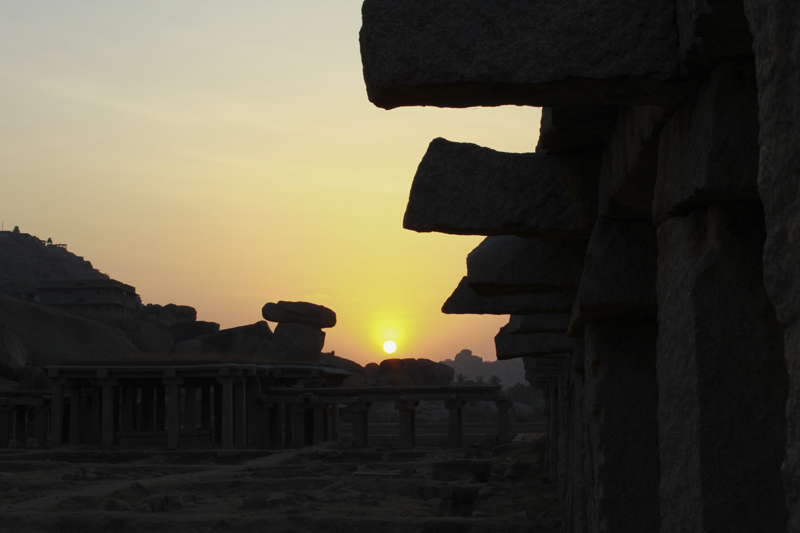 One of the biggest challenges that you will have to face in Hampi is the heat of the sun. Sunscreen lotion, sunglasses, caps are must have. And you also need to make sure that you drink a lot of water or else you might get dehydrated very quickly. Ok, after Virupaksha temple, the other main attraction very close to you is the monolithic bull which is bang opposite to the main temple. The huge bull statue is carved out of a single stone which shows the amazing skill of the people at that time even with so much limitation from a technological point of view. After a few photographs, we decided to return back to the hotel. This was our first day and so I guess we got tired very quickly. While coming to the hotel, I saw that two-wheelers were available for hire. The mopeds are definitely the best way to move around the place. Although the place is not very big, it becomes very difficult to walk in the heat of the sun and these two-wheelers do a wonderful job. After a nice sleep in the afternoon, by 5:45 we set foot for a few more places. First, it was the nice little stall from where we had a cup of tea and some biscuits. Then we went to the market and booked a bike. It costs only Rs 150 per day and if you want to keep it throughout the night then Rs 50 extra. After a quick round of tips and know-how of the moped, we set off to the Krishna temple. By then it was already 6:45 and the security guard didn’t allow us inside. But we got some amazing shots of the sunset in front of the Krishna temple. 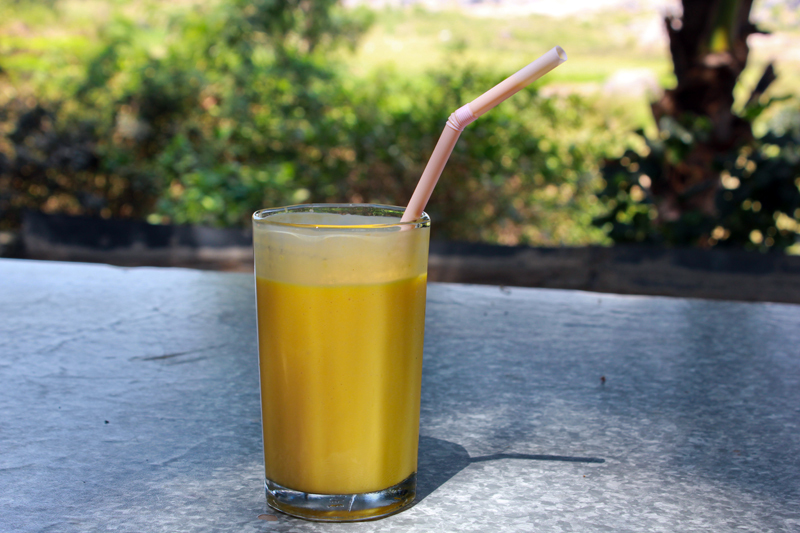 It is a strange thing that chicken and mutton dishes are not available in Hampi, although you will get an egg. Anyways, we had a bad experience at the main Hampi bazar with the lunch and so we decided to look for a better alternative to food. Roaming here and there, suddenly we found “Gopi’s rooftop restaurant. The place and the ambience are nice and the food quality is excellent. We had soup, momos and fried rice and it was tasty. I would highly recommend having food at Gopi’s restaurant. From there, we just came back to our guest house and off to sleep because next day we have a lot of things to cover. 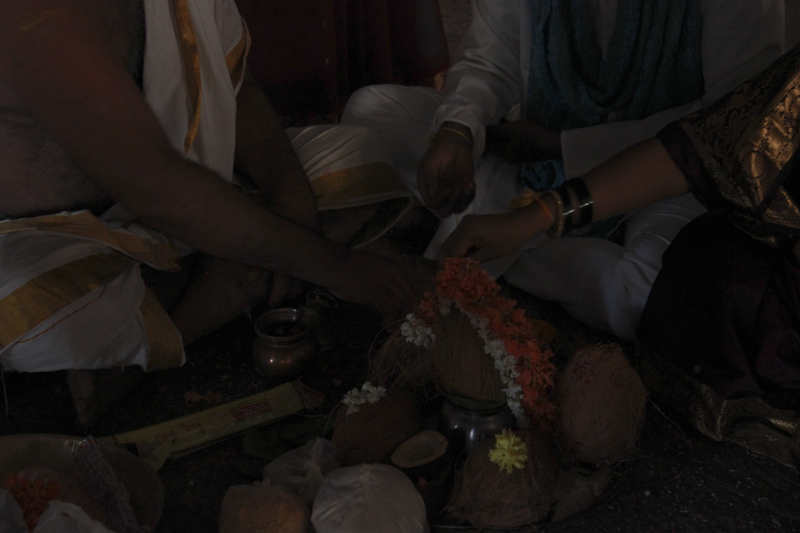 As travelling during the afternoon was tough, we woke up early and went to see Vittal temple. The place is between rocky mountains and you have to walk for like 3 or 4 km to reach the place. 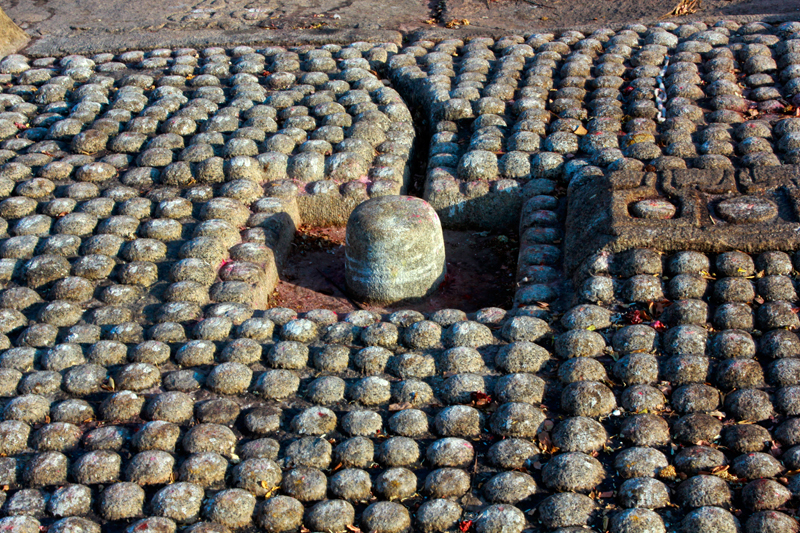 The temple opens at 8:30 and we were early, so we did some rock climbing and also managed to see the 1000 shiv lings. Inside the Vittal temple, although they don’t charge you extra for photography, tripods are not allowed. For that matter wherever I went in Hampi, inside all the monuments tripods are not allowed and if you want to capture using a tripod, then you have to take special permission from the Archaeological Survey of India department office near Hampi. 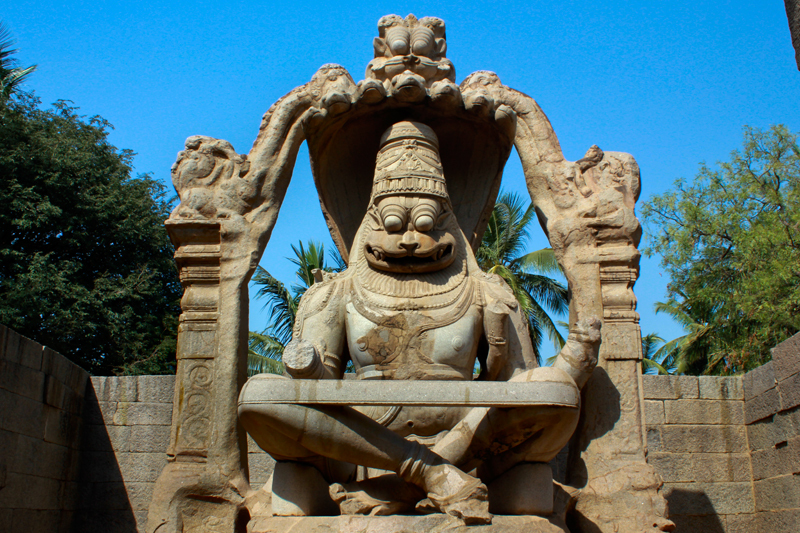 One of the most prominent structures of the Vittal temple is the Chariot. 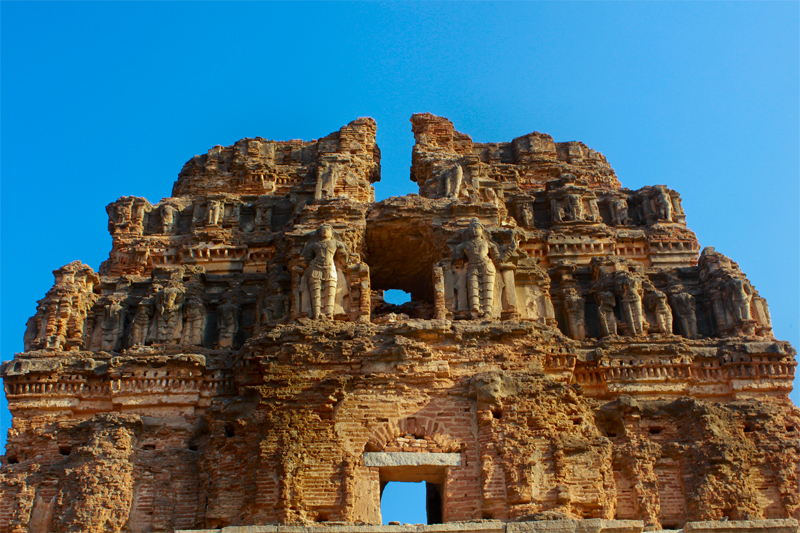 With almost all of it intact, it is a symbol of perfection. Each and every wheel of the chariot is same in dimensions. The carvings are different although the proportions are different. 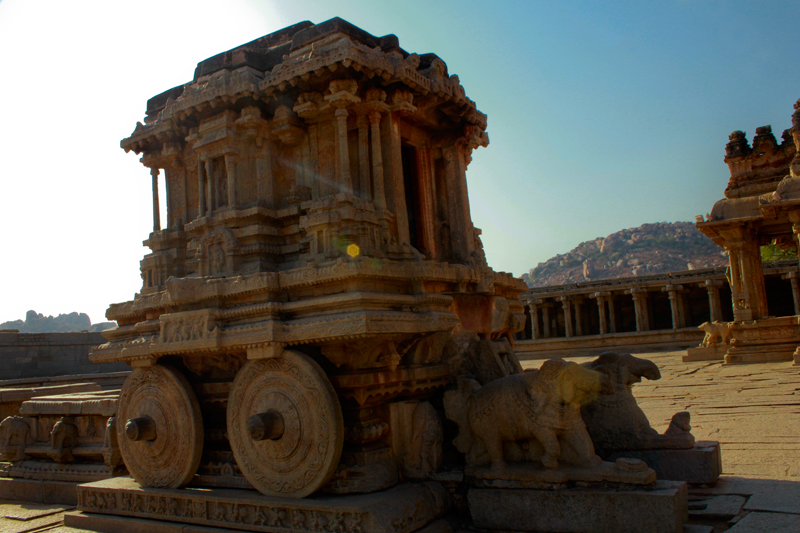 The structure is not resting on the wheels, still, the detailing done to the wheels and the way it is hidden makes you feel as if the chariot is actually resting on the stone wheels. 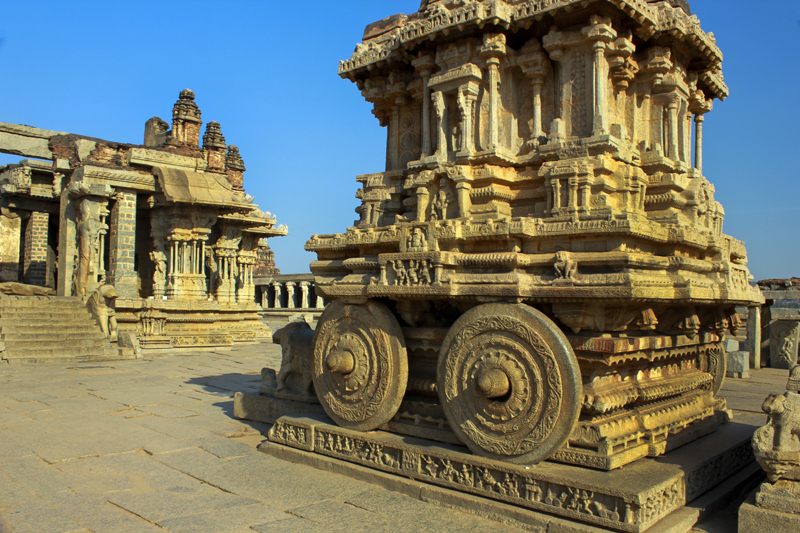 For more information about the temple and the chariot check this link: Vittal temple and the stone chariot. From there we went back to the main entrance. It is a long walk back and with the sun already at the top, the walk was getting difficult. Anyways, we had our breakfast in a small restaurant right at the entrance of the caves to the Vittal temple streak. The omelette and toast was enough for us to get back our energy. 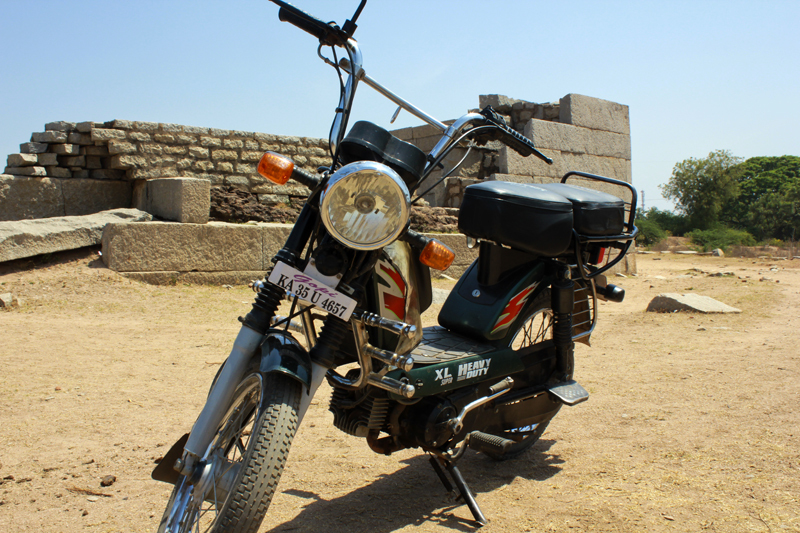 From there, we set off to explore Hampi. Driving the moped was fun through the city. Oh, by the way, we were kind of out of money and so we had to drive all the way to Kamalapuram which is like 5kms from Hampi to find an ATM. There are no ATMs in Hampi and I didn’t find a single shop accepting credit cards. But yes there are a lot of currency exchange shops which is obvious because almost 90% of the travellers were non-Indians. In some places, we were feeling alienated. In most of the restaurant, we could find foreign tourists and that might have been the reason why every hotel had Italian, Mexican and many other foods in their menu apart for the regular Indian and Chinese dishes. But yes, one thing is for sure; the food there is very cheap. The drive to Kamalapuram was fun. There we finally found an SBI ATM and after withdrawing money, we started exploring the places. First, we went to the Bhima’s gate (well actually it was an accident because we took a wrong turn :P). The place was nice and quiet. From there we went to another place where there was a temple with nice architecture but I guess people generally don’t visit that as we couldn’t find any tourist there. But yes, we got it and took some nice photographs. Then there are a lot of places like the queen’s bath, the lotus temple, the elephant’s stable etc. We covered a lot in that day and thanks to the life saviour moped. Places like Pushkarni, Royal enclosure, Queens bath etc are very close to each other and with the moped, we were able to cover them up pretty quickly. The elephant’s stable, Lotus temple is a sure shot. You should not miss it and the same goes for the royal enclosure because there you will find the famous stepped pool. By afternoon, the sun was in full force and for us now it was time to have lunch and get back to the hotel. After a nice lunch at the Gopi’s rooftop restaurant, we came back to the hotel. During the evenings there was nothing much to do. We just roamed around the place and checked the Hampi bazaar. One thing that you should not miss is the sunset. 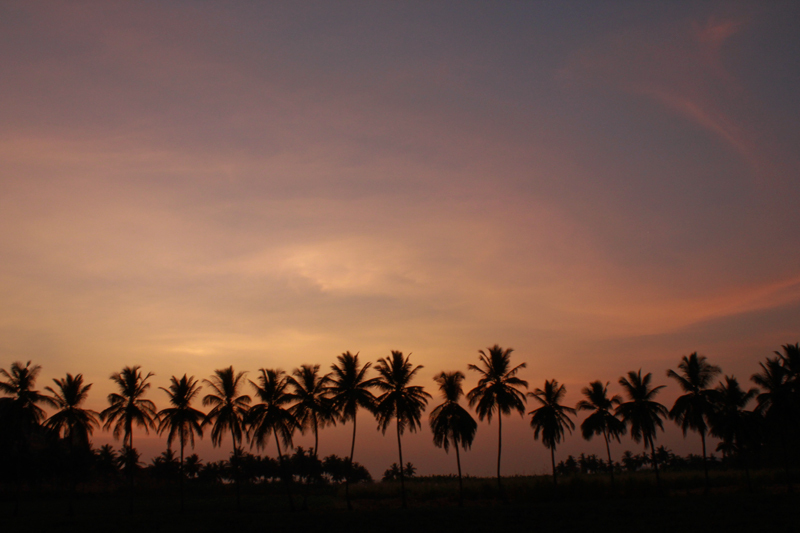 Yes, the sunset looks amazing in Hampi. The sky is very clear and so you get damn good colours during the sunset. The only thing is that you don’t get to stay inside the monuments when the sun is about to set, so book your place and get a good vantage point to shoot the sun. Personally, I found the Krishna temple a nice spot. The next day we woke up really early and went to capture the sunrise. Again it was near the Krishna temple. Its an east facing temple and so the spot was good for sunrise. Again I had a plan to take a time lapse, but tripods are not allowed and the problem is that even the guards there woke up early so I had to restrain myself from using the tripod. Once the sunrise photography was over, we went inside the Krishna temple and also checked out the Ganpati temple and other sites near that place. 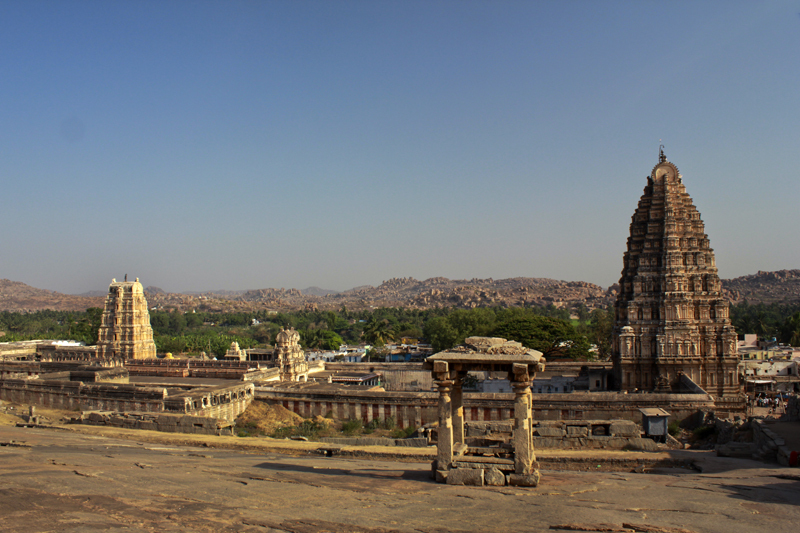 When you climb up to the Krishna temple, you get an amazing view of the Hampi city and also the Virupaksha temple. 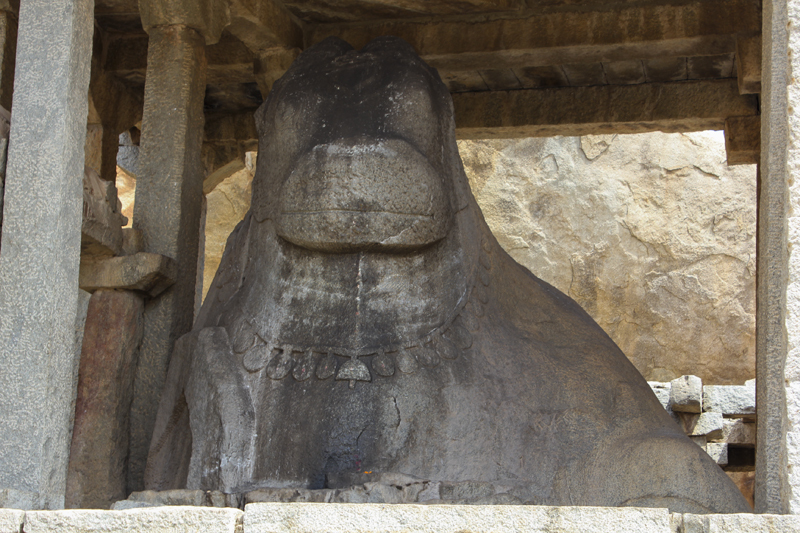 From there we went to see the monolithic statue of Narasimha. This is one of the big attraction and a piece of art. This huge statue can actually look a little frightening when seen from the front. From there we came back to Hampi for lunch. This time we went to the famous Mango tree restaurant which is in the middle of a small forest. the main attraction is the ambience of the place. The food quality is good but the main thing is their lassis. I was amazed by the number of different lassis they had. I guess even restaurants in Mumbai don’t have so many options to choose from. The view from the places is amazing. The river flows smoothly in front of the place, you can enjoy the view and have your food. The people there don’t force you to speed up things. You can go there and chill out for hours. I have seen people go there are even read books in peace enjoying the peaceful place and having tasty food. After that, it was time for us to hit the road again. It was our last full day at Hampi and so we wanted to make full use of it. 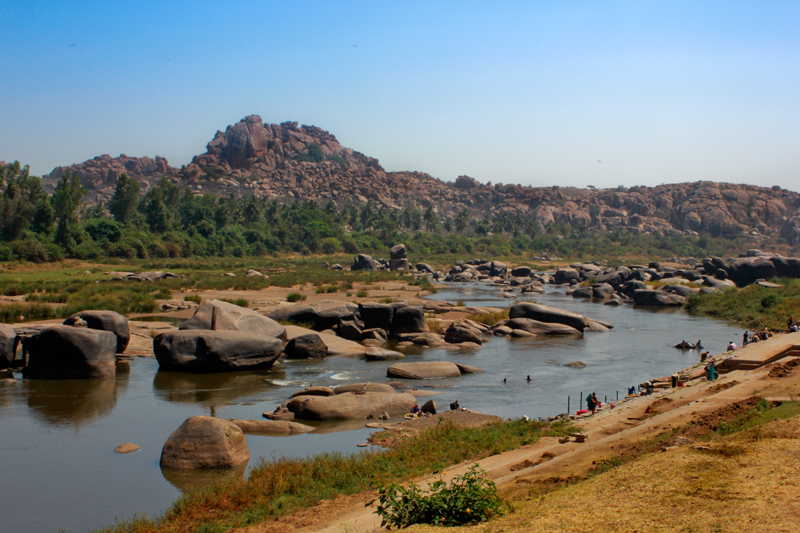 So, again we went back to Hospet from Hampi just like that. The main idea was to enjoy the ride. 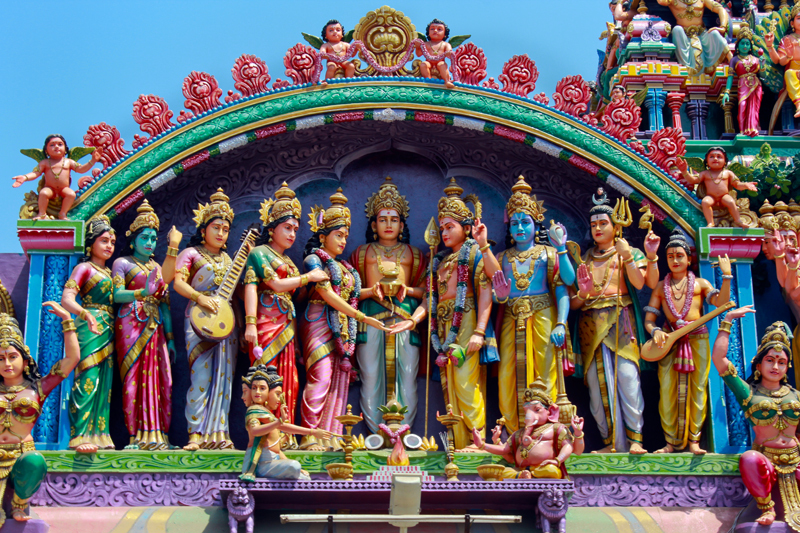 On the way, we saw two very nice temples with colourful gods and goddess. Even at once place when I was clicking a few pictures, small children came to me and requested me to take their picture. It was nice to see their simplicity and their hospitality sense even though they are living in such a remote place. Really these things come automatically and cannot be taught. After making a promise that I will mail them their picture (which I am going to do for sure) we went ahead. We did a hell lot of time pass on the road and when it was time for the sun to set, we decided to come back. On the way, I got few nice snaps and even my wife drove the moped for some time which she felt lot easy to drive than the Scotty that she drives. 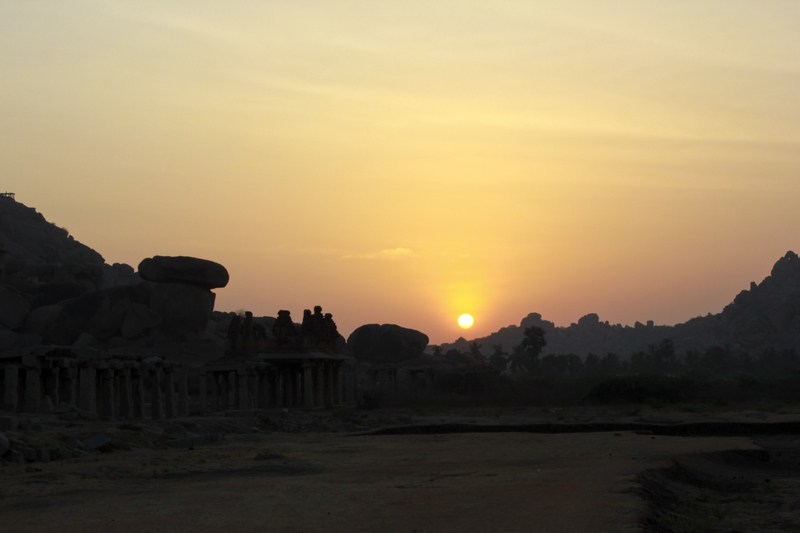 The last day at Hampi will always remain special for me. The checkout for our hotel was at 10:30 and so we left our luggage at the hotel and went to the main temple. Our idea was to sit there for some time, enjoy the silence there and have some quality time. We didn’t even take passes for cameras. 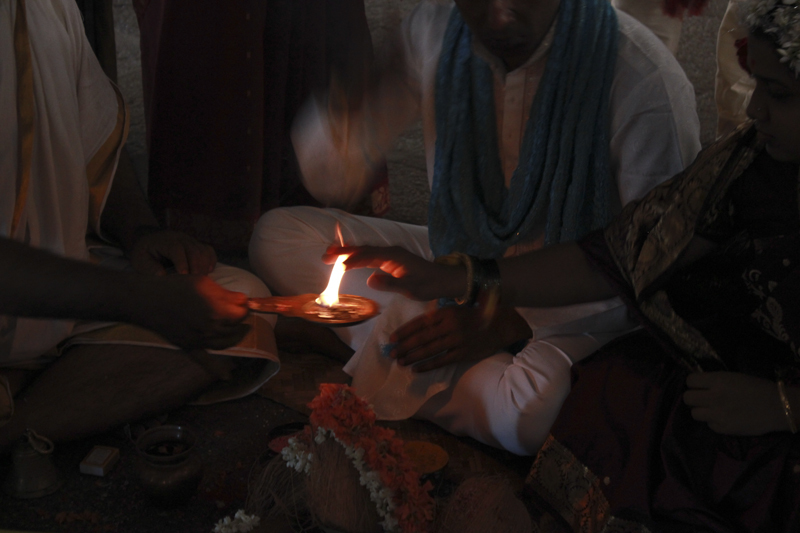 But when we went inside, we saw that two marriages were supposed to take place at the temple that day. Well, how can we leave such an amazing opportunity? I quickly went back to the counter, took the pass and believe me it was a complete surprise package. And the best part was the people were so nice and humble that it never occurred to us that we were actually visitors. ? 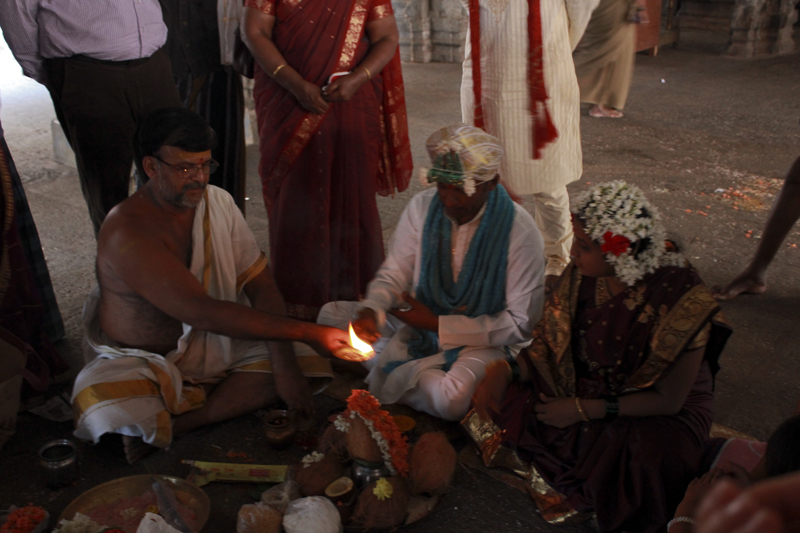 This is the first time I and my wife witnessed a south Indian marriage ceremony and so for both of us, this incident is always special. After about 2’o clock the temple closes for some time as the people there go out and have lunch. I met a person there who plays the drum and he said that his family was serving the temple for 2 generations now. He shared a lot of information about the temple after which he told us that we should leave as the temple will be closed and will only re-open after 4:30. So from there, we went back to the hotel as our bus was at 4:30 from Hampi to Hospet. At the hotel, we took some rest and thanks to Sagar, the owner of the guest house who let us rest in the room for some time for free. At 4:30 the local bus came and it took around 45 minutes to reach Hospet. In this small span of three days, I fell in love with the small village. 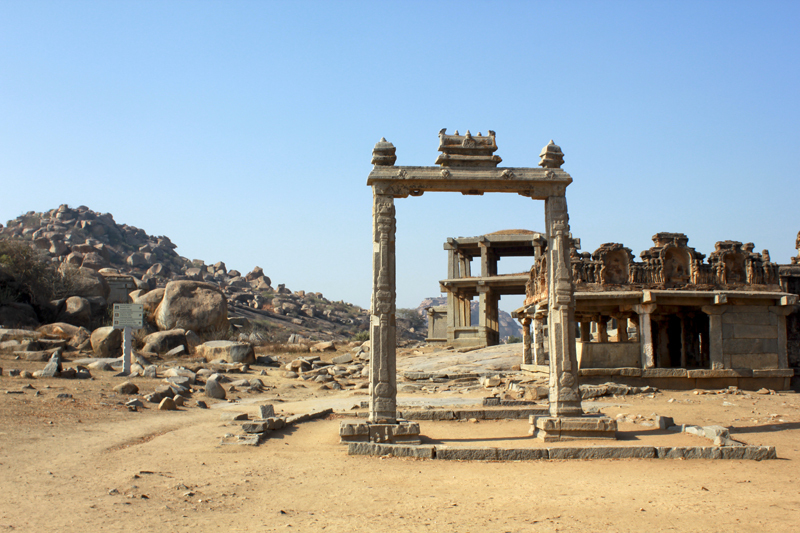 The life in Hampi might not be as glamorous as in the cities. But yes, the people out there are very nice and friendly. 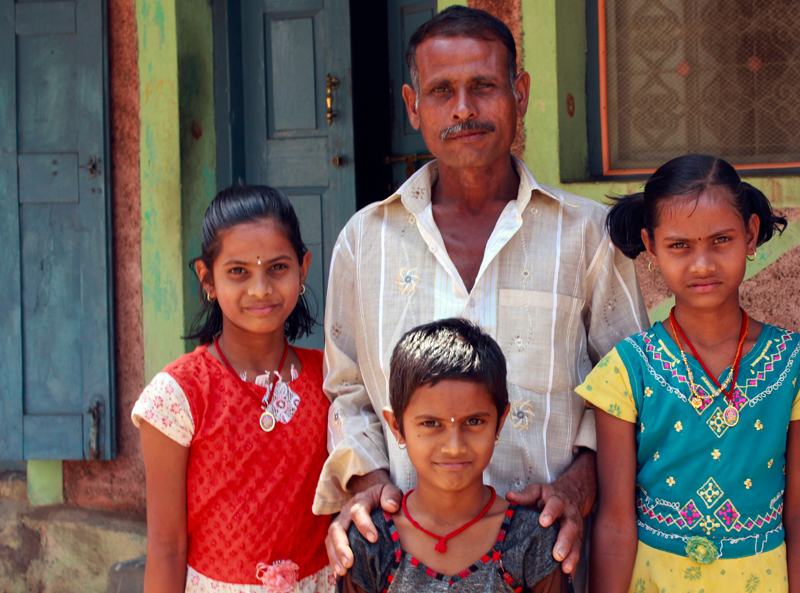 They live a very simple and uncomplicated life. It’s one of the places, where every evening you will find people coming to the temple, doing the aartis and then having a chit-chat. Festivals are something where everyone from the village gets involved. Everyone has something to do and contribute to make that festival special. We really didn’t want to leave the place, but I guess that’s how life is. You go to a place to visit, you fall in love; enjoy the place and then you need to come back where you belong and these are the things that motivate us to make such sudden plans and trips.